Microgenix Ecolase XLi is a concentrated thermo stable bacterial ∝-amylase preparation to be used for desizing. Microgenix Ecolase XLi can be used for removing natural sizes. 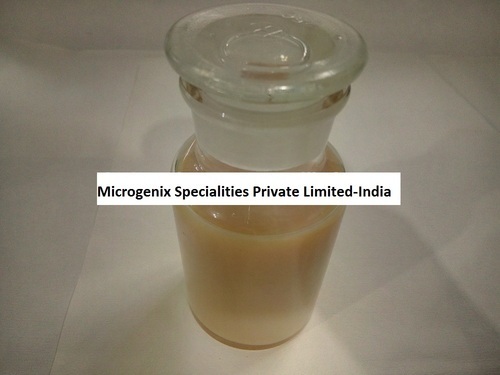 Microgenix Ecolase XLi converts starch-based sizes into dextrin, which can be easily removed by rinsing. Microgenix Ecolase XLi is stable to does not affect the typical fabric properties. A simple evolution on the graph to a growth phenomenal and limitless is what we are all about. The learnings have been quick and responses-adaptive. And the consequences are clear-in our products perceptions and contented clients. The basics are simple and essential and so are we. Ordinarily, team Microgenix does unique stuff as Quality for us is not an act but a habit.Infrastructure for us is not land, construction, facilities or communications. It is the basic underlying framework of an organization, and for us it is our team.